Granite has been used by ancient cultures in Egypt, Rome, and Greece to construct their buildings, but unpolished for structures. How to clean granite countertops was not one of their priorities, however. 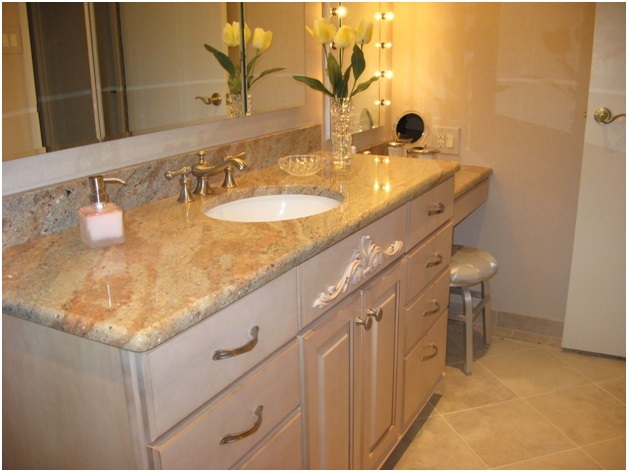 Kitchens and bathrooms were introduced in high-end houses during the early 2000s. It is extremely popular for its beauty and is costly. It’s denser than marble making it less porous than marble to absorb stains and spills. Wipe up spills as soon as they happen so your granite does not change color from the stain. Beets and coffee are bad for stains and can penetrate the surface of granite. Even though the counter top has been sealed to make it resistant to stains and bacteria, things can happen. Granite is highly esteemed and beloved for its glossy shine and the natural markings from nature. It needs to be cleaned judiciously and cautiously to not harm it. The first thing to do is wash the countertop with detergent in warm water with a sponge or cotton cloth. I’m against paper towels for cleaning anything: they shred, they get stuck in nooks and crannies, and it’s impossible to see what they have on them. Then rinse it thoroughly and towel dry with a real dish towel. Do not use anything caustic for granite such as vinegar (acid), glass cleaner (chemicals) or bleach (chlorine). Keep these cleaners far away! 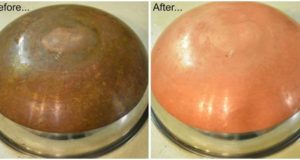 Never ever use abrasive scouring powders, rough sponges that seem to be like a Velcro® surface, or scouring pads with soap and steel wool. These will scratch your beautifully polished granite and you will cry over it. Do not scrape food particles off with knife blades. Soak the spots. You can use a 50-50% solution of isopropyl alcohol and water. Therefore, a half cup of water would use a half cup of alcohol. Cleaners with acid will make your granite dull and in time will weaken and damage the sealant. The best way is plain detergent and warm water; why buy something you don’t need? There may come a time that a stain simply won’t budge. You can use baking soda — mildly abrasive—with water and make a thick paste. Rub the spot gently with a cotton cloth. If it’s gone, rinse and towel dry. 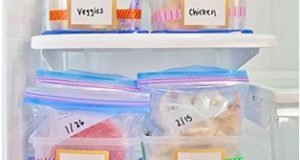 If it didn’t disappear, try putting the paste on and cover it with a bowl or plastic wrap and tape the edges of the wrap. Let it sit overnight until the baking soda and water are dry. It might take a couple of days to accomplish this. Wipe it with a wet cloth and towel dry. 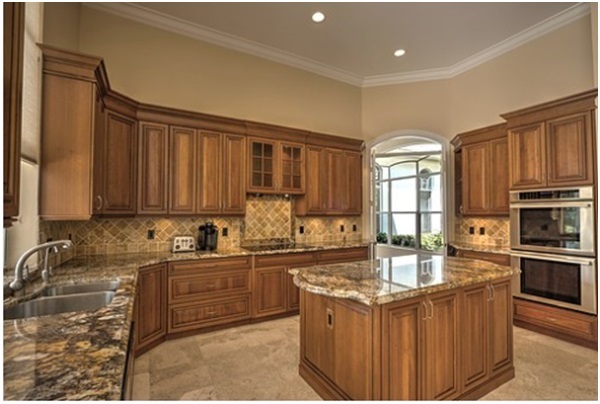 If your kitchen granite countertops, bathroom vanity granite countertop, or bathroom granite walls have become dull over time, clean with soap and water, rinse, and towel dry, then put cooking oil such as Olive, Grapeseed, or Canola, but not solid products such as Crisco® or lard and rub on buffing it in. 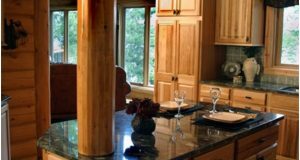 Your granite will be somewhat more stain resistant with a lovely glossy shine. After time of using your granite each day, it will naturally lose its sealant needing to be resealed. When this happens, it will absorb stains more readily and become dull. You will need to employ the professional granite people to do this. It is not a do-it-yourself project. A good timeline is to reseal every two- to four-years and that depends on the use it gets. When you have kids, of course it will have more wear. When you know how to take care of granite, it will last for years; after all, it is stone.